ONLY TWO MORE DAYS. Can you tell I am WAY too excited for the Super Bowl?! I can barely focus on anything else right now, you guys. It’s bad. 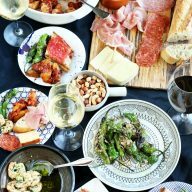 Ok, let’s focus on food for just a second, shall we? 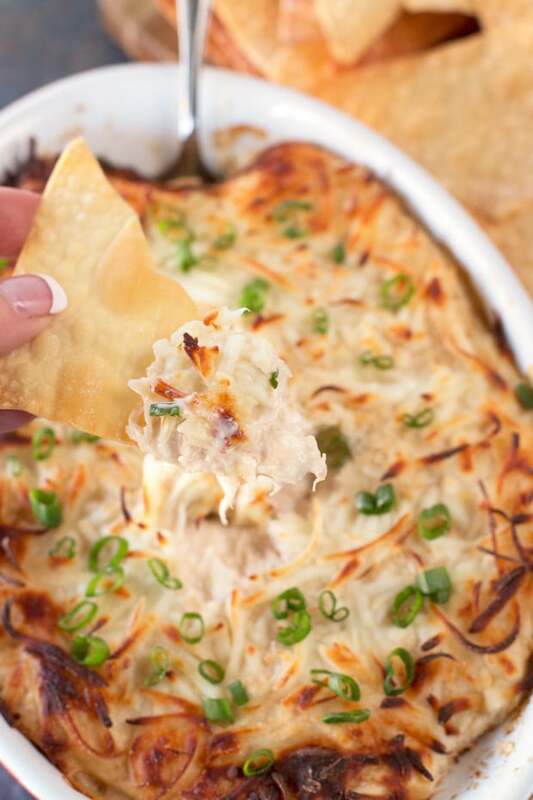 This crab dip. Oh lordy, I am losing my mind over it. Crab rangoon is one of my all-time favorite things to order when I’m getting Chinese food. Whenever the Man and I are talking about ordering Chinese, it’s the one thing that’s always on the list. Because DUH, it’s amazing. I am pretty sure this stems from an early and consistent introduction to them as a child by my parents. They are both obsessed with crab wontons and passed that obsession straight down to me. I seriously love them so so much. There’s not an order of takeout Chinese that goes without a set of those delicious little nuggets of awesome in my house, that’s for dang sure. What’s not to love though? Fried, creamy, and full of luscious crab. 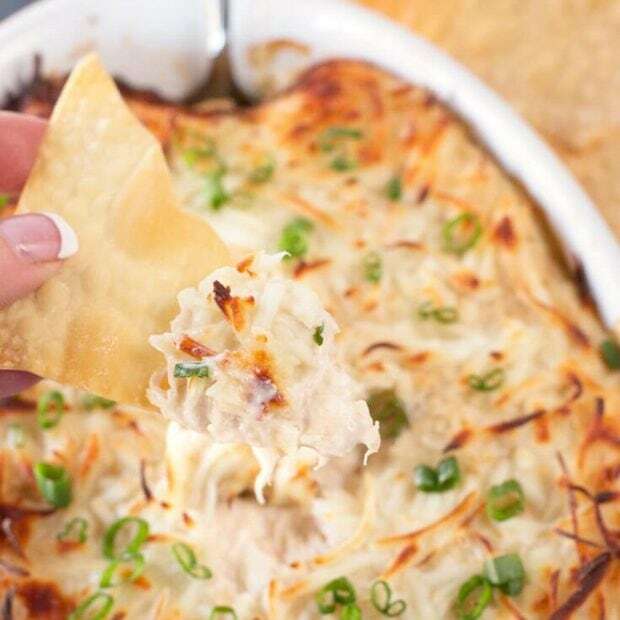 Instead of trying to make individual crab-filled wontons – let’s face it, my passion wears thin sometimes and I just want to CRAB – I flipped it inside-out to create this epic dip. Pretty dang awesome, am I right? It’s warm, gooey and tastes like the best crab rangoon you’ve ever eaten, all piled high on a crispy baked won ton chip. This dip has all the flavor of those crab rangoon wontons that you love to devour whenever you go out for Asian food! 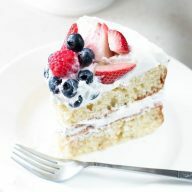 It’s infinitely easier to make and it is seriously addictive. The creamy crab goodness is packed with indulgent flavor, and the homemade crispy wontons are the perfect vehicle for shoveling all of it into your mouth! Why yes, I think I will watch How I Met Your Mother for the zillionth time while overindulging in cheesy, crab goodness. And no, I will NOT be judged for it. 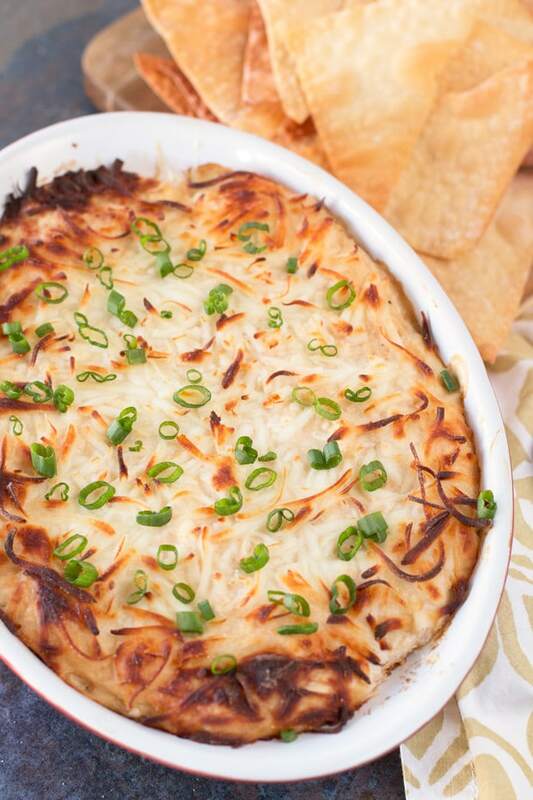 Need an awesome drink to pair with this killer dip? Check out my Chile Beer Sangria for a spicy kick! for all the mixing you ever need! 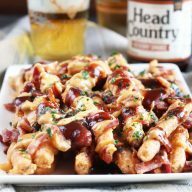 Rachael Ray Oven Lovin’ Bakeware 3-Piece Nonstick Pans are some of my favorite pans to use and they are perfect for these crunchy chips. 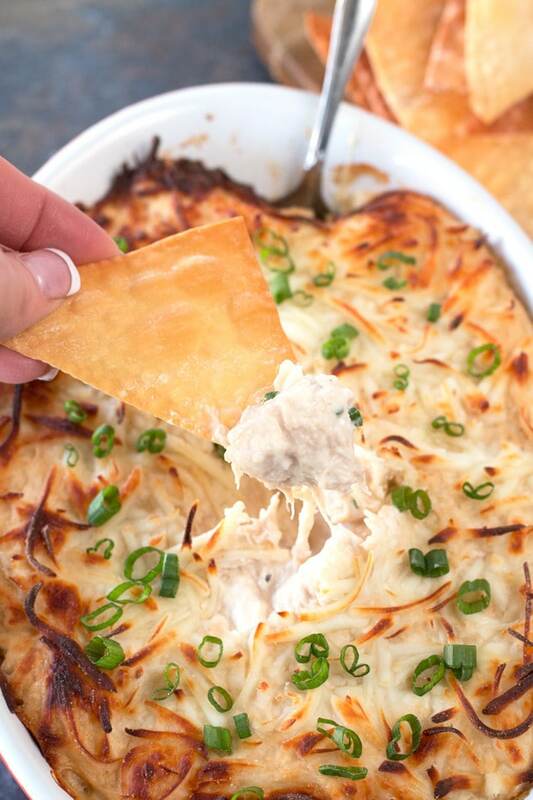 for this dip, because it’s great for baking in, but also for serving! 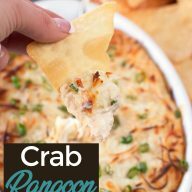 Pin this Crab Rangoon Dip with Crispy Won Ton Chips recipe for later! 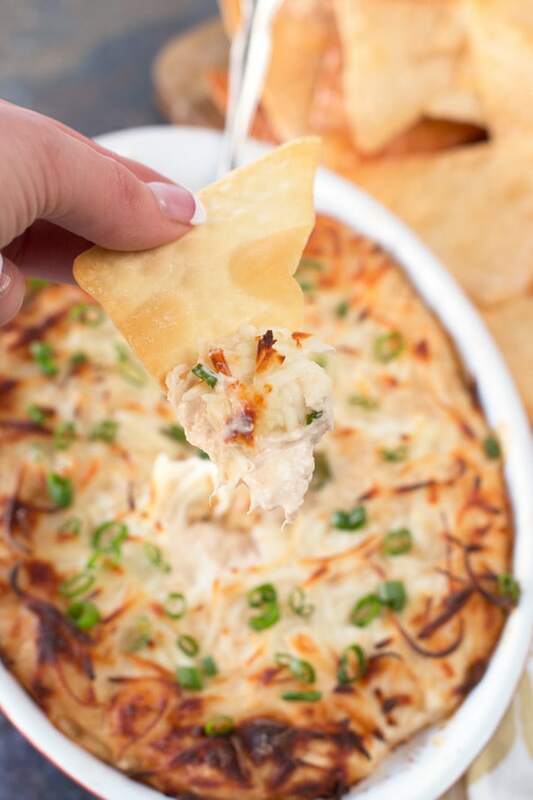 Everything you love about crab rangoon, in an easy-to-make dip with crispy chips. Add the cut won ton wrappers to a baking sheet and spray with cooking spray. Bake for 5 to 7 minutes, until golden brown and crispy. Set aside. Combine the shredded crabmeat, cream cheese, sour cream, 1 cup shredded mozzarella, Worcestershire, soy sauce, lemon juice, Sriracha, garlic, salt and pepper in a large bowl. Stir to combine and add to a casserole dish. 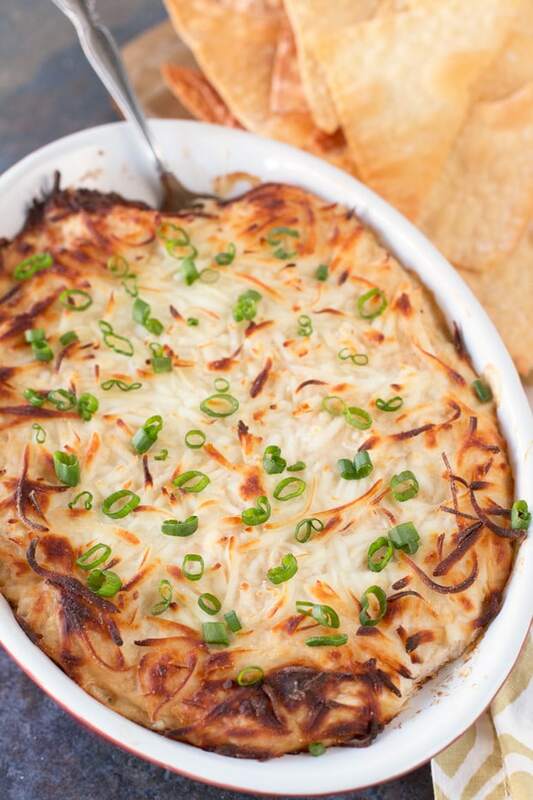 Top with the remaining mozzarella cheese and bake for 25 minutes, until the top begins to brown and the dip is bubbly. Garnish with green onion and serve warm with the won ton chips.